1989 Roadmaster Trailmate MTB - Work Stool Conversion! This camera was my very first introduction to photography. In 2005 a colleague of mine was beginning to study photography and was advised by his teacher to buy a fully mechanical SLR camera. These were made in the 60's and 70's. I think he bought this camera off ebay for about $30. 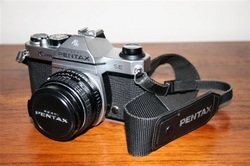 He then spotted a Pentax ME which he wanted so bought that one too (for a song as well) I was looking at the K1000 and he said that I could have it if I wanted as he was not interested in using it. So that is where it all started. 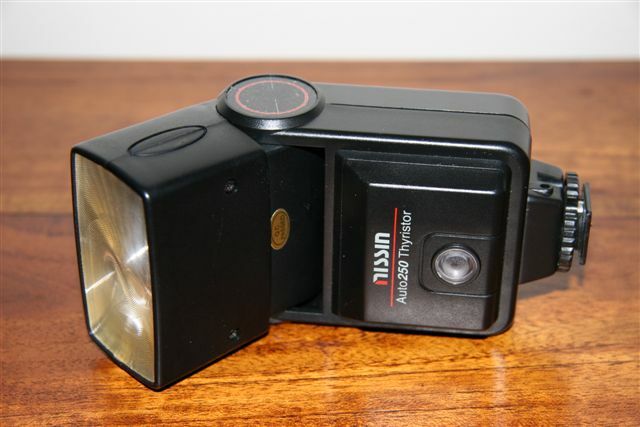 The camera is fully mechanical and only uses a small button battery for the light meter. 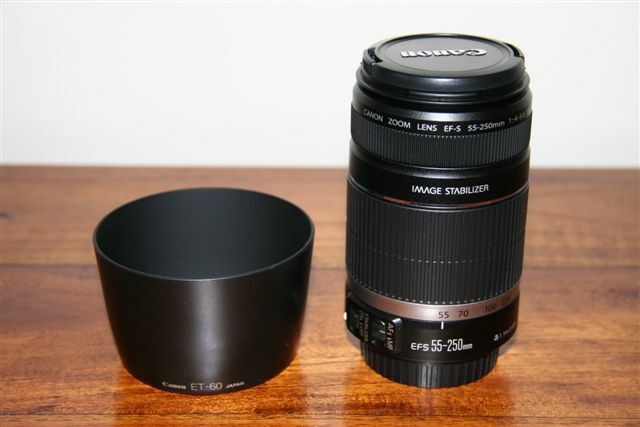 It comes with a 50mm lens as standard kit (which is of superb quality) and is a fully manual SLR. The fact that it is fully manual forces you to be very careful about the shutter, aperture and focusing because if you didn't do it right you would have wasted a shot out of your 12, 24 or 36 exp. roll. This camera is also the 'SE' model which is quite rare. I mainly shoot black and white film with it. FOR ASAHI PENTAX K1000 SE. 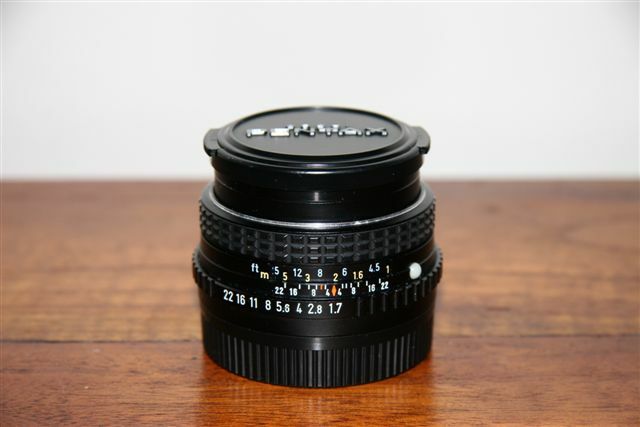 This is the standard issue lens that came with the Pentax K1000. It is a fixed lens that is suitable as a 'middle of the range' lens, great to learn on and can be used for all situations. Because it is not a zoom lens, it has excellent optics and gives crystal clear pictures everytime. I also use an Arrow A 49mm protective lens filter at all times with it, and a 49mm circular polarizing filter on some occasions. FOR ASAHI PENTAX K1000 SE. This zoom lens was bought off ebay from a deceased estate. 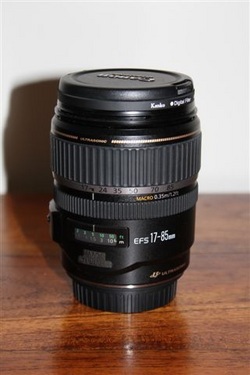 I use this lens for macro photography and still life. I have only recently started using it as I was quite happy to stick with the 50mm for a long time. I also use a 55mm circular polarizing filter occasionally with this lens. FOR ASAHI PENTAX K1000 SE. 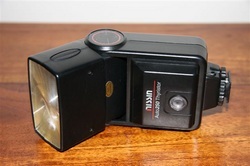 This flash unit came with the Tokina lens as a package and compliments my slr very well. It is quite light and the head can be adjusted to accommodate different angles (to bounce the flash off a wall or ceiling etc.) The flash works on the K1000 and the 20D but doesn't seem to work on the 550D. I may eventually add a Canon Speedlite 580EXII to the collection for indoor and low like work. Sometimes the longer lenses cast a shadow when using the built in flash on the dslr's. For now though, this one does the job fine. FOR ASAHI PENTAX K1000. This cable release only cost me a few dollars online and was bought mainly for 'bulb' shots of star trails as well as a few longer exposures. I have hardly used it but am planning to give it a work out once I fully immerse myself into astrophotography. 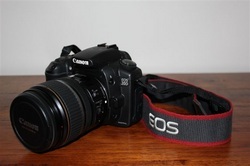 This enthusiast level camera was released in 2004 and is my very first introduction to digital slr photography. 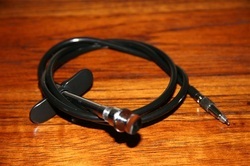 It was bought off ebay for AUD$500 in April 2011. The reason it was this price was due to the lens that came with it, which I will talk about next. The camera is very user friendly. It doesn't have a large rear LCD review screen like the latest models that are out there today (only 1.8") but it suits me fine. All the controls are really easy to use, it has a fast 5fps shutter speed, is made of metal and can take abit of a beating as well. The only downside to this camera is that it does not have a sensor cleaning function, so you would have to do it manually. The sensor will get dirty over time if you keep swapping lenses. The 17-85mm has been on the camera all it's life so this is not an issue for me. I should eventually get a cleaning kit though, as I will eventually pick up a 50mm lens in the near future. I really love using this camera and it produces excellent quality pictures for an 8.2mp camera. A great camera to learn on. 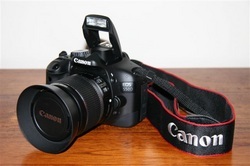 FOR CANON EOS 20D. 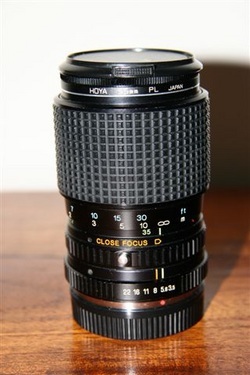 This zoom lens came with the 20D and can still be bought new today for between $400 and $500! (2011). It is an excellent lens to leave permanently mounted onto the camera as it has a great range and the image stabilization comes into its own when using it hand held. I have taken some brilliant shots with this lens and will probably never ever get rid of it unless it becomes obsolete and unable to be used anymore. The previous owner hardly used both the camera and lens and only took a total of about 7,000 shots. The shutter still has alot of life left in it so I was lucky to score the camera and this lens when I did. This camera was purchased brand new. 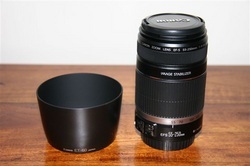 It came with a twin lens kit and the total price was AUD$1296. I could not justify spending all that money at once so I paid off AUD$200 a fortnight for a couple of months and picked it up just in time for Easter weekend. This is our family camera and is used for everyting - kids parties, sports, shows, events, family gatherings, christmas time etc. I have not really used many features of this camera yet and have been mainly using it in the 'auto' setting. To be honest I am a little afraid of it as it is so new and I don't wanna mess with it too much yet. This is why I bought the second hand 20D. This slr features HDMI Video recording, 18mp, very large LCD viewing screen and is very much lighter than my 20D as it is made of hard plastic but the internals are still very solid. A great camera for any beginner and very useful as a second camera for a professional. Although for continuous shooting it is only rated at 3fps shutter speed, which is still fast but not as fast as the 20D. The 550D is the top of the range beginners camera in the Canon range. It is a good camera for photographers of all levels and I'm sure will be in our posession for a long time. 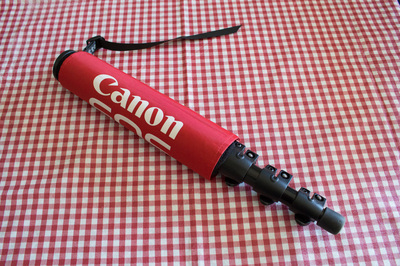 FOR CANON EOS 550D. 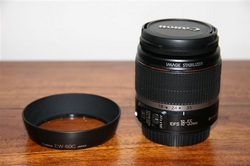 This lens was part of the twin lens kit with the 550D and is a great all 'round lens for everyday. This lens will probably be on the camera 85-90% of the time we are using it. It is very light, much lighter than the 17-85mm, and takes crystal clear shots. I have not used this enough yet but will be writing more about it soon. FOR CANON EOS 550D. 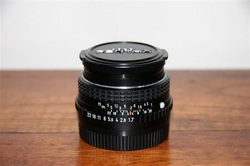 This lens was part of the twin lens kit with the 550D. Have not used this at all yet. Hope to soon though, with both Canons! Perhaps some wildlife shots. 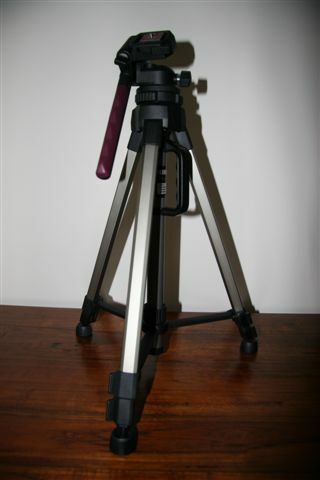 This tripod is a Giottos which has been rebranded by the Australian retailer Fletchers Fotographics as one of their in house models. Bought off ebay of course! It is a light to medium duty tripod and the head components are constructed of plastic but it is one of the better ones of this type. The head has a fluid effect action to assist smooth video panning and is fitted with a spirit level. It has one standard Giottos 6E04 quick release plate with pop up pin for video camera use and a second quick release plate with the locating pin removed for use with still cameras. Very lightweight and also has a hard carry handle attached close to the head for transporting and moving around which I have found very useful. This backpack usually retails for AUD$110 here in Oz in camera stores. I managed to find it brand new online from a store in Canada for AUD$67 which included the postage! 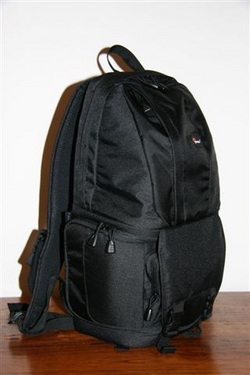 It is a smaller size backpack but can hold alot of equipment. It does not bulge out the sides of your back wilst wearing it like a normal backpack so you can walk through crowds, buses etc without bumping your bag into anyone. Quite slim. Quick to swing around to get your camera out using the side access. I use it for set photography days out or even for family outings where it can be left on one of our backs all the time. You hardly know its there.Very handy to us and it is used for all three cameras when required. This handy little bag has been with us long before I bought any of the above cameras. 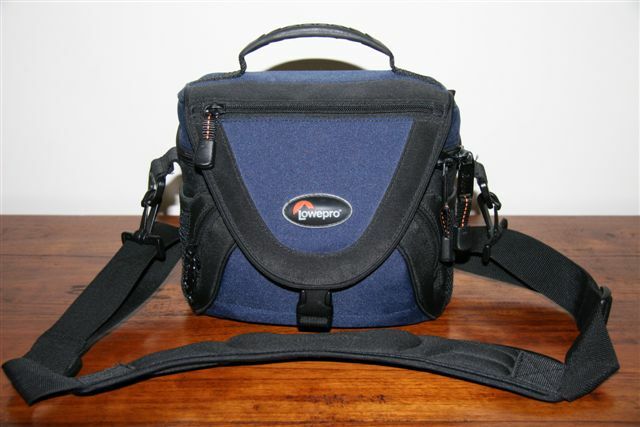 In 2004 we bought a Fuji S7000 point and shoot digital camera for our honeymoon to NZ. We took this bag and the camera all over the south island. It survived mountain climbs, hikes on glaciers, rain, frost, being thrown about in the car etc. It also features a pull out rain cover. It is able to hold the camera body with lens attached and also an extra lens. 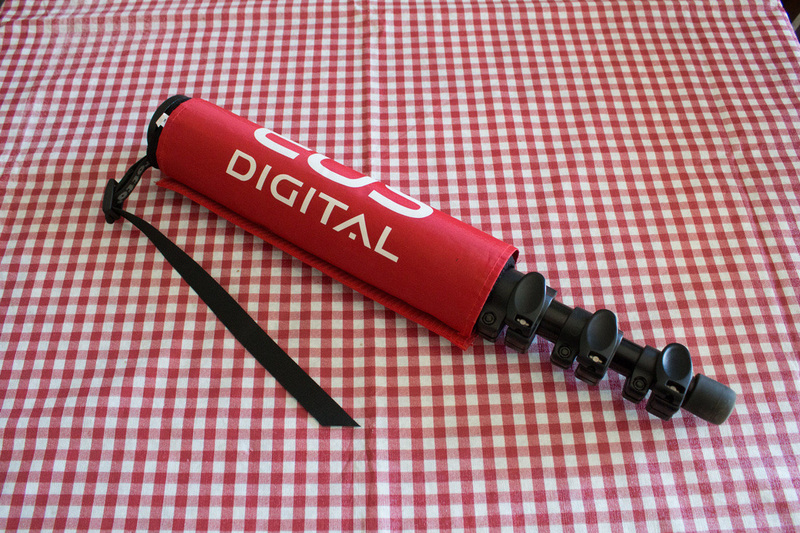 We currently use this bag to store and take out our 550D with 18-55mm lens when we need it. 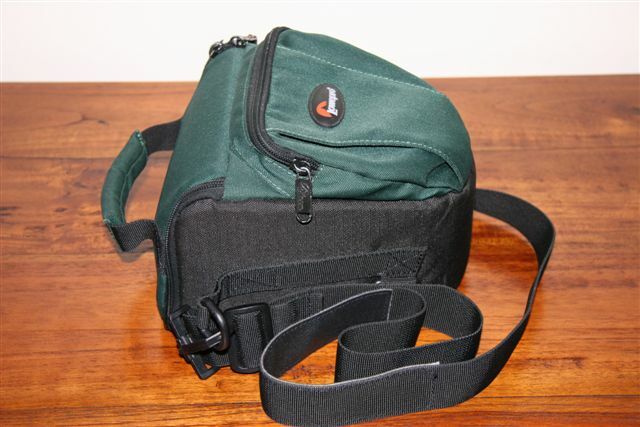 This toploader zoom lens bag is used to store my 20D with 17-85mm lens. I keep this camera bag in my backpack that I take to work. It permanently lives there. If I need to get out at lunchtime etc, then I just take it out of my work bag, slip it over my shoulder and head out. I sometimes use the bag/camera for work purposes as well so it is quite a handly little set up. Getting out of photography, so I'm selling all my gear. 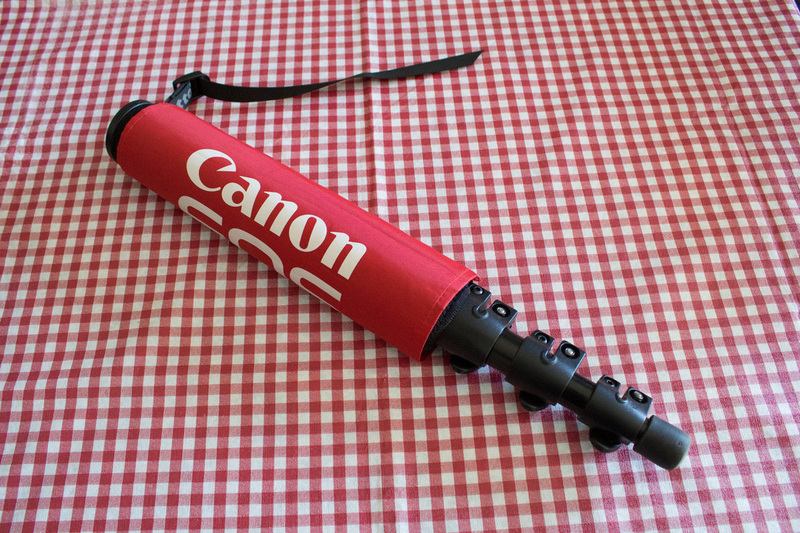 This monopod has served me well taking onboard my 400mm f/2.8 lens. It comes complete with a genuine Canon cover (which you cannot buy retail - this was a CPS giveway I bought off someone) and additional padded surround which came from a tripod leg cover set. All designed to give your shoulders and collarbone a rest !